The following report is my report in Mathematics Today June. I have made this statement a lot since I applied for the job as University Liaison Officer last October and have found general agreement from those who also received such letters and even from those who distribute them. This leads me to suspect you may be nodding as you read this! I think the process of a known local academic giving a letter to students suggesting they join is a good idea with a desirable personal touch. In my opinion, the problem is that the students aren’t aware of the IMA, its work and the benefits of joining before this point and so the letter doesn’t strike a chord. I later discovered who the Institute are, learned a little about what it does and joined up. I think the IMA has a lot to offer graduates as they embark on their careers but yet only a small percentage of maths graduates are joining (approx. 5%). The illuminating statistic here, in my opinion, is that there are around 4500 members of the IMA and there are around 4500 mathematics graduates per year in the UK. So the potential is huge! I should explain a little for those who do not know about the graduate recruitment exercise. Sometime towards the start of the calendar year the IMA writes to its contacts in UK university mathematics departments and asks how many graduates they will have this year. They are then sent the appropriate number of graduate recruitment packs to distribute to those students. They should have been received and distributed therefore during the past 2-3 months. I have spoken with people in universities who distribute these packs and appreciate their value to the students. Some people send the packs through the post to students while some hand them out in final year lectures. I have also visited universities where I can’t find anyone who is aware of receiving the packs or what happens to them. So my call for assistance this time is: are you involved with the graduate recruitment exercise at your university? I am interested in how the packs are handled. Do you have any views on the effectiveness of this campaign or what could be done to improve it? If you have any information or views on this or any other issue please email me at peter.rowlett@ima.org.uk. If you believe your university is not involved in this process then I would certainly be pleased to hear from you as it may mean we have an out of date contact in our list. In March I visited the University of Reading, where the Mathematics Department has a compulsory skills module which includes a career management component operated by the Careers Advisory Service. This is an unusual arrangement and an interesting one. I also visited Bath and Bristol and found at those universities an appetite for engagement with the IMA and particularly for careers talks given by former students who are now IMA members. In March/April I attended two half days of the 50th anniversary BAMC. It was really great to see such a vibrant applied mathematics community at work, although it must be said that most of the talks were outside my mathematical knowledge! I also attended a couple of interesting sessions at “Meet the Mathematicians”, a sixth form outreach event attached to BAMC. 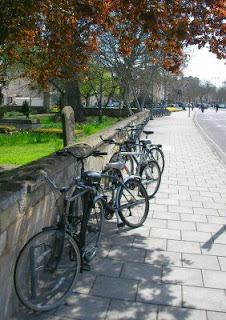 In April I spent a beautiful sunny day visiting the Mathematical Institute at Oxford. I met with several interesting members of staff and had a productive chat with the incoming organising committee for the Invariants, the student mathematical society. The Invariants enjoy slightly off-syllabus mathematics talks and are thinking about reviving a student magazine. I also spent a productive afternoon in Portsmouth visiting the Department of Mathematics and the Purple Door careers service. To round off the month I attended the Manchester Mathsoc Ball and talked to final year students about the benefits of joining the IMA. I have to apologise for the trouble with the stickers last time. For those who don’t know I wrote in Mathematics Today April that a sticker would be included saying “I’m a member of the Institute of Mathematics and its Applications – Are you?” Unfortunately this was not included with Mathematics Today as expected but instead we sent it out the following week under a separate cover. Still, I must report a huge positive reaction to the stickers. I would like to say thank you to all the people who have emailed me with their support for this idea to raise the visibility of the IMA. I have also had several requests from people wanting more than one sticker, which is very gratifying! During my visit to Portsmouth in April I saw my first sticker “in the wild” (that is, a sticker I didn’t stick to something!) on the door of Ann Heal. I have since seen others and plenty of people have told me how they have displayed theirs. It is nice to see people taking a liking to this idea. The IMA group on Facebook and the IMA Facebook App are linked to from the IMA Student page (not just for students!) at www.ima.org.uk/student or search for “Institute of Mathematics and its Applications” on Facebook. If you are attending the Eight Younger Members Conference in May you can add this to your Events on Facebook. In the Student Section this issue is a piece adapted from a careers advice leaflet produced for mathematics students by Bath Careers Advisory Service by Sue Briault. I hope you will find this, as I did, packed with useful advice. 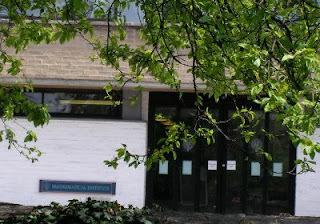 Last week I visited the Mathematical Institute at Oxford (pictured above). Last year, before my employment, the IMA gave a grant to the student mathematical society, the Invariants. Recently the committee for this changed and the new committee will take the Invariants through for the next year so it was useful to visit and meet them. I had, I think, a very useful chat with the committee. I also met some interesting IMA members and other members of staff and visited the careers service (pictured below, with the obligatory picture of bikes in Oxford! ).